Original Owner — Godwin, H. P.
Original Owner — Wood, F. A. Original Owner — Hilliard, N.
Architect — Haller, N. T.
Original Owner — Hill, Mary L.
Builder — Nolan, John H.
Original Owner — Tripp, Henry E.
Original Owner — Flemmer, Chas. 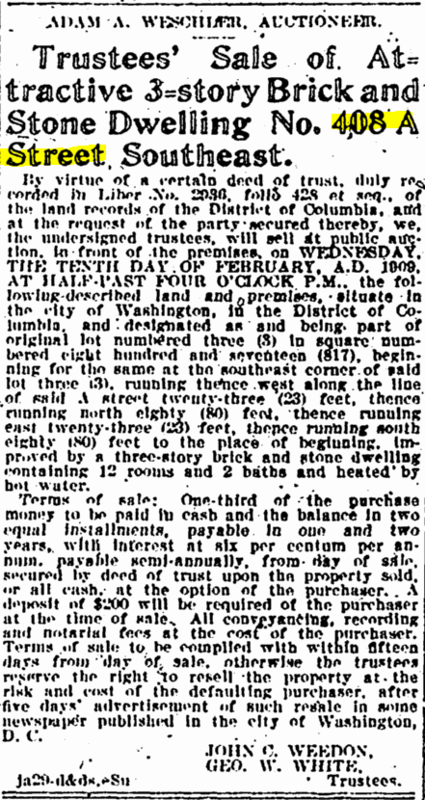 H.
Federal census, 1940, 408 A St., S.E., Washington, D.C.
Lucius T. Royall, head (owns, $12,000), 83, completed 8th grade, b. in Va., lived in same house in 1935, conductor, railroad, [no income reported]. Nellie B. Royall, wife, 70, completed 12th grade, b. in Va., lived in same house in 1935. Hattie L. Meadows, lodger, 50, single, completed 10th grade, b. in Alabama, lived in same place in 1935, clerk, government, income $2,100. Mary L. Bueschler, lodger, 29, single, completed 10th grade, b. in D.C., lived in same house in 1935, stenographer, government, income $1,620. Arthur L. Moran, lodger, 42, married, completed 12th grade, b. in Kansas, lived in same place in 1935, auditor, government, income $2,000. Frances F. Moran, housekeeper, 42, married, completed 10th grade, b. in Ark., lived in Van Buren, Ark., in 1935, housekeeper, private family. Arthur L. Moran, Jr., son of housekeeper, 21, single, completed 1 year of college, b. in Ark., lived in Van Buren, Ark., in 1935. Lewis Gayle Moran, son of housekeeper, 19, single, completed 11th grade, b. in Ark., lived in Van Buren, Ark., in 1935, clerk, retail market, income $470. John Ruppel (laborer); Joseph Ruppel (laborer). Joseph Ruppel (laborer); Joseph Ruppel (shoemaker). Joseph Ruppel (laborer); Joseph Ruppel, Jr. (shoemaker). Joseph Ruppel (watchman); Joseph Ruppel, Jr. (shoemaker). Joseph Ruppel (flagman); Joseph Ruppel, Jr. (shoemaker); Philip Ruppel (messenger); William Ruppel (baker); Margaret Huhn (widow of Nicholas Huhn). Joseph Ruppel (flagman); Philip Ruppel (cigarmaker). John W. Ruppel (oysters); Joseph Ruppel (watchman); Philip H. Ruppel (driver). John W. Ruppel (laborer); Joseph Ruppel (flagman); Philip H. Ruppel (cigarmaker). John Ruppel (watchman); Joseph A. Ruppel. Joseph Ruppel; Charles W. Herbert (shoemaker). M. M. Robinson (Capitol Police); Everard Bierer, Jr. (pension applications, Interior Department). Agnes McCarthy (domestic); Victoria Trook (teacher). Isaac R. Hill (clerk); Victoria V. Trook (teacher). Isaac R. Hill (clerk, Capitol). Isaac R. Hill (clerk, Capitol); Franc [sic] C. Thompson (Library of Congress). Charles E. Colliflower (broker); Charles E. Colliflower, Jr. (law student); George C. Colliflower (student); James E. Colliflower (student). Annie C. Colliflower; Annie M. Colliflower; Charles E. Colliflower (broker); Charles E. Colliflower, Jr. (clerk); George C. Colliflower (student); James E. Colliflower (student). Charles E. Colliflower; Charles E. Colliflower, Jr. (stenographer); George C. Colliflower (clerk); James E. Colliflower (clerk); S. A. Grace Marriotte (Bureau of Printing); George R. Cooksey (Associated Press, Star Building). Charles E. Colliflower (broker); Charles E. Colliflower, Jr. (clerk, District); George C. Colliflower (clerk); James E. Colliflower (clerk). Courtney W. Hamlin (House of Representatives, Missouri). Courtney W. Hamlin (House of Representatives, Missouri); Carl Hamlin (messenger, House of Representatives, boards). Lucius T. Royall (conductor); Robert E. Royall (highway engineer, Department of Agriculture). Charles F. Booher (member of Congress); Joseph Hainan (superintendent). William W. Rucker (member of Congress); Charles F. Booher (member of Congress). William W. Rucker (member of Congress). Edward E. Royall (clerk); Lucius T. Royall (conductor); Robert E. Royall (highway engineer, Department of Agriculture). 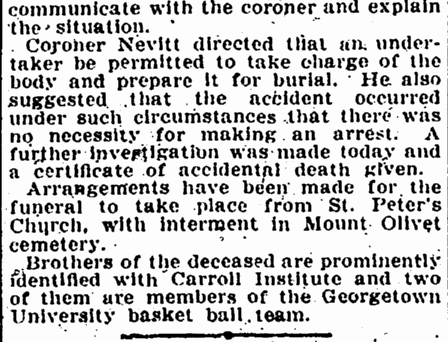 Washington Evening Star, 24 June 1909, p. 22. 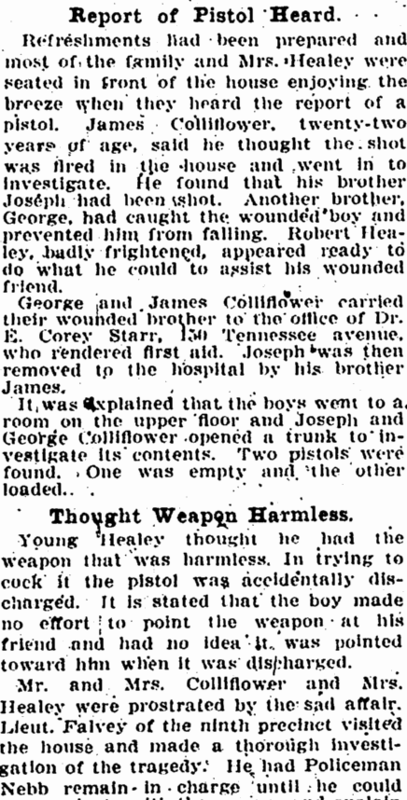 Washington Evening Star, 2 February 1909, p. 18. 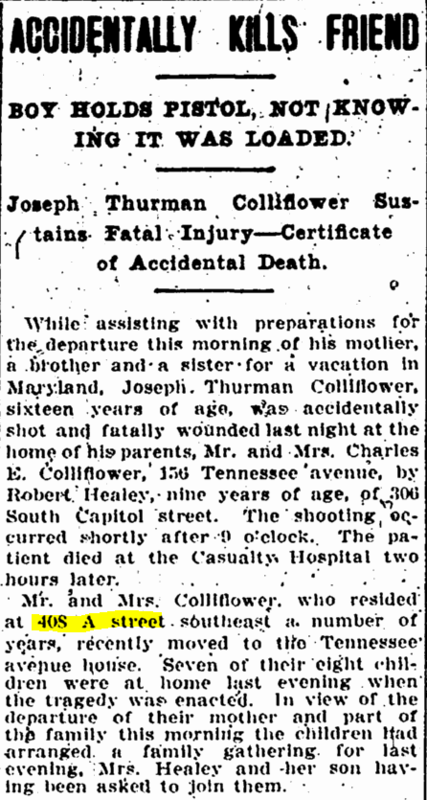 “Died.” Washington Evening Star, 25 March 1891, p. 5.